The Church Building Through the Years. William Atkinson made a petition to the Bishop of Chester in March 1848 that “on account of the great increase of inhabitants in the township of Ashton an additional church for divine worship together with a cemetery is become neces­sary”. He was granted permission to build the church which was consecrated at a service held on 9th March 1849. On the evening before the service William Atkinson entertained the Bishop to dinner. The following morning at Ashton Hayes house the Sunday and day schools were presented with a banner, and an address signed by 85 householders was presented to William Atkinson. A pro­cession then proceeded from the house to the church for the consecration ser­vice at which prayers were said for the founder and his wife. the addition of a chapel on the north east corner and a vestry on the south side. The tower originally had a stone pinnacle at each of the four corners. These were probably removed in 1931 when some repairs were carried out to the tower. The height to the top of the spire is about 116 feet high – approxi­mately one quarter of the height of Salisbury Cathedral. 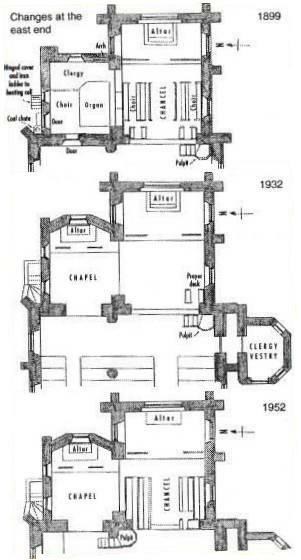 The 1848 plan of the church shows more pews than currently exist and there was a gallery under the tower which seated about 30 people, making a total seating capacity of 280. In the chancel were two large pews reserved for the use of the patron – the carved “poppy heads” on them are almost certainly those on the pews at the back of the church today. On the south side was a private door through which the patron could slip out if he wished. An annual schedule of rents for use of the 27 most prominent pews was levied at 2/- per person. The pulpit was on the left, looking at the altar, with a prayer desk on the right for the minister, who had free use of the front right pew. The choir sat in the gallery. 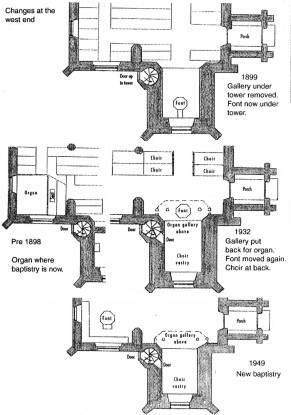 A barrel-organ provided music for the services until some years later when Mr. Atkinson’s son presented the church with its first organ. This was sited where the baptistry is now. The church bell was made in 1848 by the Whitechapel Bell Foundry, London, and weighs 9 ¼ hundredweight. In 1946, alter more than five years silence dur­ing the war, the bell supports and bearings were found to need urgent attention. They were repaired by the church wardens and four parishioners. The clock was fitted in 1855 by J.B. Joyce & Co., the oldest existing tower clock firm in the world. Established in 1699, and located since 1780 at Whitchurch the firm still maintain the clock today. The slate dial covers an unusual mechanism of Joyce’s own design. Only six similar mechanisms are thought to have sur­vived. Little is known of the church history between its consecration and the arrival of Ambrose Heygate to be vicar in 1896. He left in 1904 having made a consider­able impression on the church. By 1897 pew rents were abolished and the patron had given up his right to the chancel pews which were re-arranged for the use of clergy and choir. Douglas and Minshull, Architects of Chester, prepared a scheme for alterations for which a faculty was obtained in 1899. The work included a reredos, a new altar on a six inch high dais, a communion rail, a lectern and a credence table. Tablets containing the 10 commandments were removed from the east wall and the chancel was completed with a plain wooden dado. A new organ chamber was provided on the north side of the chancel. The space behind this chamber became clergy and choir vestries, with an external door on the north wall and an internal door on the west side. The pulpit was moved from the north to the south side. The doorway on the south side of the chancel was blocked up. Pews under the east window of the north aisle were removed and replaced at the west end where the organ had been. The gallery at the west end was removed as was a wall in order to turn the former vestry into an open-fronted baptistry. The present pulpit, carved by local craftsmen, was donated in 1908. Thirty years of calm followed the turn of the century, in which the appearance of the church remained unchanged. But it did not last and there then started another round of great activity. This photograph (circa. 1910?) documents the church well before those changes began. In 1928 electric lighting was installed to replace the paraffin lamps. The font was moved to a position forward of the step into the present choir vestry. This allowed the old baptistry to be converted into a choir vestry which was cur­tained off and full length cupboards for choir robes were fitted to two walls. The rapid sequence of events in the 1930’s suggests the work was planned by Ernest Johnson, the patron and churchwarden, before his death in April 1930. The Reverend W.B.H. Canton had only been in residence for one month when the conversion of the baptistry to choir vestry was proposed. By July 1930 the vicar was explaining proposals for the “Chapel of the Holy Spirit” which was to be a memorial to Ernest Johnson. Architect Theodore Fyfe of Cambridge detailed the proposals to the P.C.C. in December 1930 and application for a faculty was made in February 1931.
chapel was completed with a vaulted ceiling and decoratively plastered walls. The carvings on the altar are copies of scenes found in the Cathedral of Seville. The new chapel was dedicated by Bishop Henry Luke Paget on 30th August 1932, followed by an 8 am communion the next day – The service took place in an interregnum between Reverend W.B.H. Canton and Reverend CC. Cooke and there were only 37 communicants! At this time the glass in the east window was changed, a new reredos provided and new tiles were laid on the floor of the sacrarium. The choir stalls were moved to the back of the nave. A proposal to move the pulpit to the north side was not carried out. At a meeting in December 1936 the P.C.C. was informed that “the vicar and churchwardens are considering certain plans for the beautifying of the chancel. It is not possible to give any details yet but the matter will be brought up at the next meeting”. It was not until June 1937 that the vicar spoke on the subject of chancel decoration – which was by then being carried out – and explained why he had not been able to call a meeting of the Council before the work had begun! The work involved was the elaborate painting of the chancel roof and the angels mural on the east wall. A new, wider altar was also provided. In September 1937 a special meeting was called to consider plans for a new choir vestry and P.C.C. room to be built on the north west corner of the church, and a proposal to move the memorial tablet to William Atkinson. The first proposal was not implemented, presumably because of the threat of war. However, the tablet was moved from the chancel wall to above the entrance door. Unfortunately this means the figure’s eyes are looking towards the organ loft instead of down the length of the church. 1. Tarmac church drive and paths. 2. Enclose the choir vestry. 3. Make baptistry at the north west corner. 4. Erect new choir stalls in the chancel and move pulpit to north side. Items one and two were completed by the end of 1948. To commemorate the foundation of the church, the Bishop of Chester conducted a service on 6th March 1949 – after some doubt whether he would get to the church due to heavy snow the night before. Work on the baptistry had already started and June 1949 saw it completed and the pulpit moved to the north side of the church. A dedication service for the new baptistry was held ‘on 10th July 1949. In October 1949 a special meeting of the PCC decided by 19-2 to re-apply for permission to erect new choir stalls. But, due to a procedural fault, this applica­tion also failed. The choir still moved from the back of the church to the chan­cel, but they had to sit on chairs. The movement of the choir found favour with the organist, choir and regular congregation. The minority objection was eventu­ally overcome and permission granted for the new stalls. In March 1952 the vicar and churchwardens appealed for funds to complete payment for the centenary scheme work, and the Bishop of Stockport conducted a dedication service on the 103rd anniversary of the church consecration, on Sunday 9th March 1952. Since 1952 no significant alterations have been made. Recent efforts have con­centrated on a programme of maintenance work and decoration following the restoration appeal of 1965. In December 1985 the church became listed as a Grade 2 building of special architectural interest. Except for one memorial tablet such things are small and unobtrusive. On the west wall of the porch is a memorial to Percy and Dorothy Minshull and inside, above the entrance door, a relief bust to the memory of William Atkinson and an inscription on the lintel stone. Nearby is a plaque in memory of 14 men who lost their lives in the 1914-1918 war. Near the entrance to the clergy vestry is the memorial to Henry Cuttil Stubbs, vicar from 1883-1891. On the west end of the south choir stalls there is a carving referring to the centenary of the church. In the chancel is a board carrying the names of all the vicars from 1849 to 1991. On the centre column are memorial plates to two church wardens, Walter Carter and Thomas Robinson and on the column at the entry to the Baptistry one to churchwarden Thomas Carter. Round the corner in the Baptistry, in a glass-front­ed case, is a tapestry made by Mrs Violet Johnson in 1932, depicting St. John the Evangelist on the island of Patmos. The Baptismal Roll in the Baptistry was presented by the choir at Easter 1952. It starts in September 1941 with Elizabeth Furness, but earlier names, going back to April 1889, have been entered later. In the 103 years to 1992, 2142 names are listed. A brass jug for use in the Baptistry carries an inscription in memory of Edward Alvey, schoolmaster and church organist for 30 years until his death in a road accident in 1921. There is a plate in the pulpit dated 1907 carrying the name of the designer F. Crossley and of the five men who carved it. The east end of the north choir stalls has two plates in memory of long-standing members of the congregation, Grace and Ruth Dobie, Alfred Allman and Edith Rachel Hopwood. Holland for the occasion of the 450th anniversary of the Diocese in 1991. In the chapel there are memorial plates to Major Eric Johnson and his wife Violet, The two stained glass windows are also in memory of Major Johnson, one from his fellow parishioners and one from his brother. In the sanctuary, at the bottom right of the large stained glass window is in inscription in memory of Ernest Johnson from his child men. The two small stained glass windows are in memory of William Atkinson and his wife Elizabeth. The communion rail extension is a memorial to the Reverend Canon E. H. Barnes. Other memorials in the church are two wooden alms dishes in memory of Walter and Florence Carter and a small lectern in memory of Stuart Patterson and Christopher Parker, two small boys who drowned in the parish in 1973. A plate in the clergy vestry records its carpeting and curtaining in 1978 in memory of Maude Craven. The two candlesticks, altar cross and processional cross in the sanctuary were carved locally in 1937. The alms dish on a stand on the window-sill to the right of the altar was carved by the same men, Thomas and Walter Carter of Mouldsworth. There are twelve segments of different kinds of wood all grown locally and intended to represent the twelve apostles, one called Judas because it has a flaw in it. With the building of the church William Atkinson also gave Communion plate, and further plate was given by the Johnson family when the memorial chapel to Major Johnson was built. In May 1987 Ashton Hayes Primary School presented the church with a flower pedestal. On the east side below the large window is the Johnson family vault. It was con­structed with the church and intended for William Atkinson, who did not foresee his move to Southport. Across the road is the church school built in 1847 and licensed for divine service in April 1848. Services were taken there until the church was ready in March 1849. The school was used during the week as a day school for 105 girls and 150 came to the Sunday School. In 1969 a new school was opened, built because of the increase in parish popu­lation. The old school continued until 1980 then closed when the roof was thought to have become unsafe. In 1984 it was leased for use as a village hall and after roof repairs and other work it was reopened for this purpose, under the management of the Ashton & Mouldsworth Village Hall Association. On the south side of the church, just beyond the car park, is the Women’s Institute hall which was a gift to the village from Mrs Violet Johnson in 1924. The war memorial was moved to its present position in 1964 from a site on the left side of the entrance to West End, opposite the Golden Lion public house. The car park was laid in 1973 on land which was previously the school garden. At the west end of the car park is a border of shrubs and trees planted in 1986. At the invitation of the vicar, people donated these as memorials. On the west side is the vicarage, built at the expense of William Atkinson and enlarged in 1928 by the generosity of the patron Major E Johnson. He also increased the value of the living. The majority of the graves are on the north side of the church and, the original graveyard having been used up, the church bought the field beyond. In 1932 and again in 1972 additional 40 foot wide strips were consecrated as burial grounds. There are now about 1370 people buried in the churchyard, more than the present population of the parish. Three former vicars are among those buried in the churchyard, the Reverend J. Godson and the Reverend F. T. C. Stubbs on the south side and the Reverend A.W. Webb on the north side. Several bombs fell in 1940, one only missing the church by about 50 yards. Fortunately it landed in an unused part of the churchyard. A faculty was granted in 1971, giving up 274 square yards of the churchyard to allow Cheshire County Council to widen the road and remove overhanging trees. This involved exhuming 58 bodies from 14 graves and re-interring them in a communal grave, which can be seen in the north east corner. The work was done in 1972/1973. Perhaps William Atkinson, when he came to live at Ashton Hayes, had similar thoughts which led him to finance the building of St John’s. In the second half of the century, while the population of England and Wales doubled again, there was little change in the population of Ashton H ayes. Not until 1961 did it begin to grow, reaching 1280 in 1981. Between 1819 and 1938 the owners of Ashton Hayes estate were patrons of the living and since then Keble College, Oxford, has been the patron. On the south wall of the chancel of the church is a list of the priests who have served as vicars of the parish. There have been 18 up to 1990 and, excluding the outstanding service of 38 years by Canon E.H. Barnes, the average tenure of the living has been six years. Some of them are referrred to below. The first vicar from 1849 to 1853 was the Reverend G.E. Smith. Before being ordained he had published a botanical work and made many contributions to botanical and natural history magazines. The Reverend A. G. Pittar, 1864 to 1877, was apparently reluctant to leave the parish after 12 years and broke the news in an unusual way. On 24th September 1877 he took his last service and preached his last sermon without giving the slightest hint that he was leaving. After the congregation had gone, his farewell message was left in the empty pews. It was during his time here, in about 1871, that two cottages in West End, Ashton were converted into a mission room, the vicar having collected money towards the cost. This is now known as the Parish Room but in 1923 was described as the Village Hall. The Reverend G.H. Staite, 1877 to 1883, was a man very concerned about work­ing conditions for women and children, and he approached Lord Shaftesbury who had introduced the Factory Acts in parliament. In 1884 a meeting was held which lead to the foundation of the London Society for the prevention of Cruelty to Children which later became a national society. The Reverend A. Heygate, 1896 to 1904, was responsible for the first major alter­ations to the church. He had come to this parish after 15 years in Newfoundland and met in the young patron Roger Charlton Parr a man willing to participate in the changes he proposed. Not only this but Roger sold the vicarage to the church commissioners for the modest price of £500. The Right Reverend C.H. Douet, 1904 to 1906, came from Jamaica where he had been Assistant Bishop, and brought with him two black servants. He suffered greatly from illness and his incumbency is the shortest on record. The period from 1928 to 1937 when the Reverends W. Canton, C.C. Cooke and A.W. Webb were here was a period of great alterations in the church. In 1941 began the outstandingly long service of the Reverend EH. Barnes, later to be honorary Canon of Chester Cathedral, who was vicar for 38 years. During this time Canon Barnes suffered some long periods of illness and great stress, particularly during his scheme to mark the centenary of the church to which there was a small but influential opposition. Canon Barnes was a local councillor, Chairman of the Tarvin Rural District coun­cil and Chairman of the Parish Councils’ Association. He worked for improve­ment to the water and sewerage systems, housing to rent for poorer people and improved bus services. The Reverend J.D. Miller became vicar in 1980, just after the church architect had made his quinquennial inspection. By 1983 much of the architect’s recom­mended work had not started due to lack of money. in 1984 John Miller pro­posed that a public appeal be launched with a target of £40,000. The appeal was started on 7th March 1985 and by 10th April its target was reached. A progress report after six months showed a total of £57,000 promised, mostly by covenanted donations over the next seven years. There were 241 donors and 93% of the total was raised from parishioners and some regular worshippers who lived outside the parish. It is interesting to note that in the parish magazine of October 1949, 36 years earlier, the vicar wrote that at that time about 24 people had contributed to the Centenary Fund. The seven year period has now expired and the Chairman of The Friends of Ashton Hayes Church was able to say in a letter of thanks in July 1992, that most of the money raised had been expended. A few thousand pounds will be held by the Trust against the day when roof repairs are necessary. The Trust fund is on-going and it remains open for anyone who wishes to assist this long term objective. After Mr Miller’s retirement in 1987 the Bishop of Chester proposed that it should be possible to combine the task of vicar of this parish with a part-time diocesan appointment. He wished to start a new three times a year diocesan newspaper. The Reverend S.R Marsh came in 1987 to be vicar of the parish and editor of the diocesan newspaper. The newspaper ceased publication due to insufficient financial backing, sponsorship having previously been provided, in the main, by a company in Warrington which changed hands at short notice. After this Simon Marsh, at the Bishop’s request, accepted in 1990 the position of vicar at St. Paul’s Church, Macclesfield. In 1991 the Reverend W.B. Faull was appointed as a non-stipendiary vicar to the parish alongside his post as Senior Fellow in the Veterinary Faculty of the University of Liverpool. He was inducted by the Bishop of Birkenhead on 25th July. On being asked if I would write a history of St. John’s church, my first thoughts were that there could be little to say about a church built as recently as 1849. I hope you agree that what has been written proved me to be wrong. There have been some interesting (and intriguing) happenings in connection with the church and some interesting people involved. The research has been difficult but rewarding. It has been a great pleasure to talk with some of the older mem­bers of the parish, and a challenge to find my way around the mysteries of the Records Office in Chester, My thanks go to all those who have helped in the preparation of this history. Much information has come from an unpublished his­tory of Ashton Hayes, written by former school-teacher Mr S. Jackson and com­pleted about 1952. In conclusion, it is interesting in this 1990’s Decade of Evangelism to read the following handbill advertising a service in 1854.